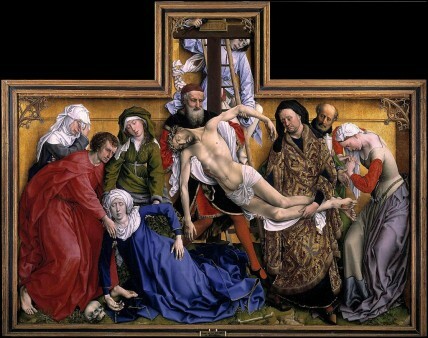 The Descent from the Cross was possibly the central panel of a triptych, which was commissioned by a guild of crossbowmen for a chapel in Leuven. Rogier van der Weyden’s Descent from the Cross is a masterpiece that is characterized by a heightened sense of theatricality. The ten figures depicted in the painting resemble a group of actors that have been asked to perform on an unconventional stage. As they are crammed in a confined space that is both narrow and shallow, the painting exudes an unsettling, claustrophobic sense. The emotion that emanates from the intense drama taking place inside is heightened significantly. Furthermore, extreme emotion is portrayed in the physical reaction of the Virgin Mary and the contorted position of mourning of the woman on the right edge (Mary Magdalene). The Virgin’s overall position echoes that of Christ, conveying a state of ultimate empathy. Everyone has tears on their face or is extremely sombre. But the expression of the woman on the left edge of the painting (Mary of Clopas) and of the man holding Christ’s feet (Joseph of Arimathea or Nicodemus) are the most striking of all, as they are the ones that are currently crying. They are portrayed as consumed with crying, both expressions so lifelike and moving. Mary of Clopas is standing in the corner inconsolable, her eyes closed, her face covered in tears, wiping them, holding her head, with her whole body bent from sorrow, while the man is shown to cannot stop his tears either, his mouth turned downwards, his forehead frowned and filled with protruding veins. The figures are elongated and the depiction is naturalistic, both in the Early Netherlandish style. Among them, the fainted Virgin Mary stands out, with her blue dress and her ghostly appearence. The continuity with netherlandish art, however, is enriched, as the Virgin’s pose was an innovation at the time in the Netherlands. It was an occurrence in the art south of the Alps, with reference to the alleged incident called The Swoon of the Virgin. As it was a contested idea, the Swoon was often depicted covered in an air of ambiguity, so as to be plausible that the Virgin might be depicted as struck with sorrow and supported by others. In this painting, however, the Virgin is shown to be surrendered to gravity, appearing, moreover, paler and more lifeless than the dead Christ Himself. 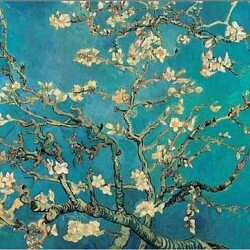 It is important to keep in mind, also, the size of the painting, when contemplating its effect. The figures are life-sized, a fact that gives the art work an imposing air and also has the effect of making the viewer identifying with the protagonists even more. Taking into consideration all the aforementioned elements, it becomes apparent that invoking emotion is a priority for van der Weyden. The textures of the skin, the wood and the fabrics are masterfully rendered, through the contrast between light and shadow, the depiction of natural imperfections and the reflection of the light on the golden surfaces. The artist also offers us an amazing demonstration of his talent in creating illusionistic space, by the method of forshortening and by clearly placing his figures in different depths, which he, nonetheless, chooses to subvert with a detail at the top of the painting. The young man on the ladder rests his right hand on the cross while holding with that two of the nails that have been removed from Christ’s body. The edge of one of the two long nails is placed in front of the illusionistic wooden frame, thus alerting the viewer of the illusory quality of what is so skillfully created. Why shatter the illusion? Is it a wink addressed to the attentive viewer? Is it a form of compliment towards the viewers, that the artist expects them to possess an open mind and a vivid imagination? Whatever the case may be, Rogier van der Weyden is clearly an intellectual himself, thinking about perception, about the physical world, thinking about his art. The Descent from the Cross was possibly the central panel of a triptych, which was commissioned by a guild of crossbowmen for a chapel in Leuven. Two small crossbows can be found in the two lower illusionistic spandrels of the painting, but all four spandrels resemble themselves vaguely to crossbows, as well. Christ’s and Mary’s arms are also placed in a position resembling a bow. All the above are ingenious choices on the part of the artist, as they constitute subtle references to the patron’s identity. They are choices that portray him as a shrewd entrepreneur as well as a bold and masterful artist, that daringly customizes the commissioned work, but does so in a manner that adds aesthetic value for every viewer and not only symbolic significance for the patrons. On a final note, it can be argued that the positions of the arms of the Christ and of the arms of the Virgin Mary together form a diagonal that traverses the heart of the painting and draws the viewer’s attention to the left. The line that is formed if we connect Christ’s elbows, the Virgin’s left elbow and her right wrist, is directed towards the ground, and, particularly, the skull, which happens to be a reminder of the belief that Adam, the first man was buried in the site of Christ’s crucifixion. It may, nevertheless, act at the same time as a symbol of death, especially combined with the two particular figures, prompting, thus, the viewers to contemplate their own mortality.